Yamada Hiroshi asking his questions on the comfort women in House of Representatives Budget Committee session on 20 February 2014. Screen capture courtesy Shuugiin TV. For those of us who are formalists - who tend to believe that Abe Shinzo, Suga Yoshihide and the rest of the Abe Cabinet should be judged on what they say and do, not what we think what their words and actions mean -- last week was a pretty good week. Prime Minister Abe Shinzo Abe and Chief Cabinet Secretary Suga Yoshihide successfully deflected the demands of Japan Restoration Party member Yamada Hiroshi for an immediate investigation and moves toward repudiation of the Kono Statement -- this after Yamada's distasteful badgering of 87 year-old retired Deputy Chief Cabinet Secretary Ishihara Nobuo over how the Kono Statement came to be. Suga, when pressed by Yamada for some kind of action on the Kono Statement, promised that the government would study whether or not it was appropriate to continue protecting of the identities of the 16 Korean women interviewed as a part of the drafting process of the Kono Statement -- this since the use of these anonymous and thus uncheckable interviews is proof, in revisionist circles, that the Kono Statement is not based in fact. 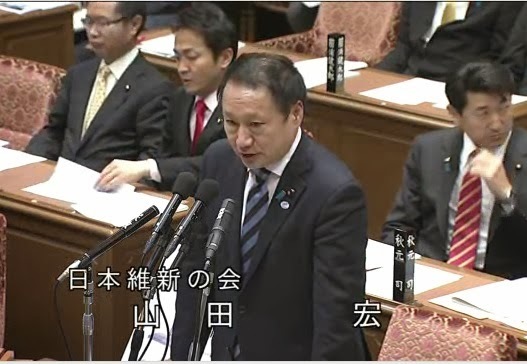 Later, when Yamada could not get the credit for pushing the government where it did not want to go, Suga also thought out loud about whether or not the government should study an investigation of the interview process. Considering the pressures Abe and Suga are under from their own rank and file to put some meat on the program of "casting off the postwar regime" (Link) these vague promises seemed to indicate a general Cabinet consensus that hate it though they might there is no alternative to the Kono Statement -- not if Government of Japan wants to have a relationship of any kind with the Government of the Republic of Korea. Then on Monday, after the end of the day's session in the Budget Committee, Abe Shinzo may have thrown everything into doubt. Unfortunately for anyone wishing to say "Aha! I told you so!" no one seems to know what it was that Abe said to Yamada. If you ask the newspapers, literally each and every one of them has a different answer. "From the public opinion polls (of one part of the news media), those in favour (of an investigation) of the Kono Statement exceeded 60%. It is all thanks your questions, Sensei." "In the government and the Diet, let us divide up the workload according to our roles." The Mainichi Shimbun quotes the PM as telling Yamada. "High levels of public support for this in the public opinion polls (of one part of the news media) are achieved thanks to the questions you, Yamada-san, asked us." "Let us cooperate because there are some things the government cannot do alone." "In the public opinion poll, those in favour (of revision) are around 60%. Thanks to you, Yamada-san." “In public opinion polls (of one part of the media) agreement has topped 60% regarding the investigation of the Kono Statement. Thanks to you, Yamada-san." "It is necessary for seriously discuss of this matter, without any dilly-dallying." Now as far as I have been led to understand, the kisha clubs are a cabal where the news organizations get together and decide as a group what the news is, leaving the framing to the editors of each organization. If so, why does each outlet report the Abe-Yamada conversation differently? One answer is, of course, is that the source of the story is Yamada himself, at least according the Sankei Shimbun. This would set the bar of veracity at very low level. Yamada could very likely have given a different version of the conversation to each media company. "For myself or for this government, I have never ever said anything about a revision of the Kono Statement." As long as the members of the Cabinet keep denying that a revision is what is being discussed, I will hold my breath -- in hope. At least until Abe Shinzo personally tells me otherwise. Later - The main message is, whatever you read, don't panic. Whoever it was who said, "You are entitled to your own opinions but you are not entitled to your own facts," clearly was not a reader of Japanese newspapers.